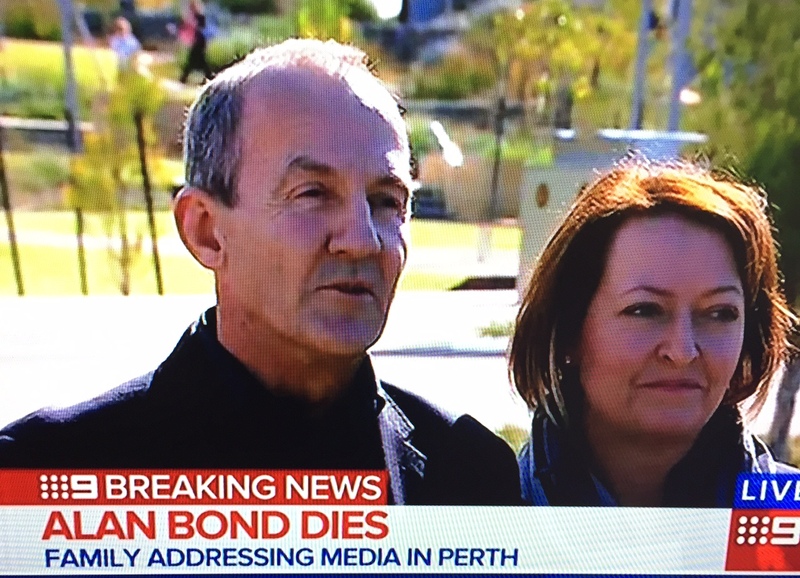 In breaking news, Australian businessman Alan Bond has died. He never regained consciousness after a heart operation to replace a heart valve. Son John has just addressed the media. Ex wife Eileen Bond was flying in to be by his side. She was expected to fly from London to Perth today but it is understood she may not arrive until the weekend. "His body finally gave out after heroic efforts - he never regained conscious after his surgery on Tuesday," said John in a press conference just now. Alan had surgery at a Perth hospital this week to replace a heart valve that had previously been replaced about 20 years ago, as well as repairs to two other valves. "To a lot of people dad was a larger than life character," John Bond said. "He really did experience the highs and lows of life - but to us he was just dad." Alan is of course best known for being the first non-American to win the America's Cup sailing trophy, and he was once the owner of Channel 9. He was also part of the biggest fraud case in Australian history. He was jailed in 1997 for a $1.2 billion fraud involving his takeover of Bell Resources, but was released in 2000 after a successful High Court appeal. In 2008, BRW magazine named him among the 200 wealthiest people in Australia, with an estimated wealth of $265 million. Alan married theatre producer Diana Bliss - his second wife - in 1995. She died by suicide in 2012.